Ethereum is the leading blockchain app platform that was proposed in 2013 by Vitalik Buterin and went live on July 30, 2015. As the harbinger of the second generation of blockchains and home to the second largest digital currency in the world, Ether (ETH), the Ethereum project has started a new era of blockchain development that enables a global community of developers to unleash their creativity in the space. The ability to craft smart contracts gave developers a chance to think about new use cases for blockchain technology that previously remained largely connected to cryptocurrencies. Ethereum also gave enterprises, organizations, and startups the ability to issue their own tokens, and build their own unique blockchain ecosystem using the Ethereum framework. Till date, Ethereum-based ERC20 tokens have been the most popular means for launching Initial Coin Offerings. Of course, Ethereum is still in development and has faced some hurdles. It has faced problems related to scalability, which was highlighted when the popular game dedicated to internet-bred cats called CryptoKitties managed to clog its network in December 2017. However, with a unique concept, upcoming developments, a strong developer community and the first-mover advantage (second only to the mighty Bitcoin), Ethereum is one blockchain project that continues to remain at the forefront of DLT and crypto development. In a nutshell, Ethereum is an open source Smart contract and Decentralized Application Platform. The Ethereum whitepaper describes the project as the next generation distributed computing platform, that provides a decentralized virtual machine known as the Ethereum Virtual machine EVM. The latter is able to execute Peer-to-Peer contracts by means of Ether (ETH), its proprietary crypto fuel. Blockchain technology is used as a tool of shared consensus, while Ether is the digital asset that is used to pay for transaction fees and computational services. Since the advent of the Ethereum project in late 2014 and its explosion of popularity within the confines of the nascent crypto space and beyond, Ethereum has always been compared to Bitcoin. All being similar to the use of Blockchain as the underpinning technology, both projects are fundamentally different. The main difference between them is the purpose of each one. In fact, Bitcoin was built as an alternative to regular money. Bitcoin can be used as a medium of value exchange, a means of payment and a store of value with no central authority to issue or control it and no intrinsic value or physical existence. On the other hand, Ethereum is rather a platform for developers to build and run Peer-to-Peer executable contracts and decentralized applications. Block time generation (seconds in the case of Ethereum and minutes in the case of Bitcoin), the rate at which new coins are mined (constant in Ethereum and halves every 4 year in the case of Bitcoin), the proof of work hashing algorithm (Ethhash in Ethereum, and Sha 256 in Bitcoin), and the total supply (capped to 21 millions in the case of Bitcoin and uncapped in that of Ethereum) are the other differences that set both projects apart. The Ethereum Virtual Machine (EVM), is a 256-bit quasi-turning-complete virtual state machine that forms the runtime environment for smart contracts and specifies the execution model for such contracts. The machine is stack based, altogether separate from the main Ethereum Network, and has its own independent storage model. In fact, all the nodes on the Ethereum Network run the EVM in addition to validating transactions. The EVM could be seen as a testing ground for Smart contracts because once these contracts are deployed to the mainnet, such a step can’t be reversed. Any developer that wants to build on Ethereum, could deploy his/her untested code on this network of computers and see how it muddles along. In Ethereum each operation or work performed by the network has a cost assessed by the network which is known as a gas limit. In order to execute a smart contract, for example, developers need to pay for all the operations featured in their code. Sending Ether from one wallet to another one involves four gas units. These gas units are checking your balance, transferring ETH to a receiving address, subtracting ETH from your balance and adding ETH to the receivers. So gas units refer to the smallest measurement of work needed to settle a given operation but don’t have a monetary value. The cost is paid in Ether. Gas is that unit that translates into Ether. Since Ethereum can only compute a limited number of gas units at any given time, miners are sort of bribed by network users to pace up the stream of request that is being sent over to the network. To pay miners, small fractions of ETH named Gwei are attached to each gas unit, which sets the gas price. 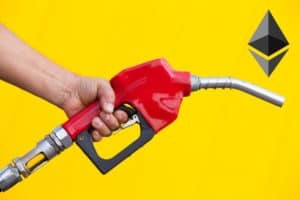 What everyone should remember is that the gas price is how much you pay per gas unit, and the gas limit is how much work you are requesting from the network. Smart Contracts – What Are They and How Do They Work? Smart contracts refer to computer codes that facilitate the exchange of value whether it is money, property or content. They are called contracts because they translate the terms of an agreement, and smart because they automatically execute themselves once specific triggers are met. The notion of smart contracts was around way before the advent of Bitcoin or Ethereum. Quick Fact: Nick Szabo a computer scientist, cryptographer, and law scholar, started pioneering work on the concept in 1977, with the aim to establish a distributed ledger for storing contracts. Simply put smart contracts are just like regular contracts in the real world, where two parties or more agree to specific terms of an arrangement and commit to sticking to it once signed. The main difference is that Smart contracts are fully digital. Furthermore, when running on a Blockchain like the Ethereum Network, a smart contract acts as a self-operating computer code that automatically executes itself once specific conditions are met. Blockchain-based smart contracts are immutable and would run exactly as programmed once deployed without any possibility of censorship, downtime, reversing, or third-party interference. Smart contract enabling Blockchains are regarded by many as the “real deal,” this whole Blockchain revolution came up with since its rise to prominence. We crafted a list of ten blockchains, other that Ethereum, that support Smart Contract programming and deployment. Cardano: a project that caught a lot of media attention, and that is allegedly developing a smart contract platform that seeks to deliver more advanced features than its competitors do. EOS: a Smart Contract platform for industrial scale dApps deployments through a DAO model, commonly referred to as the alternative to Ethereum. NEM: written in Java, the NEM platform is arguably one of the simplest to use since no specific platform programing language is required to code and deploy smart contracts on it. Waves: the underdog of this list, it is an open source smart contract platform that focuses on scalability and speed of settlements. Other interesting blockchain projects that could play an important role in the future of smart contracts, are Hyperledger Fabric, Lisk, NEO, Qtum, Stellar Lumens, and Tezos. Smart contracts make Ethereum flexible, providing it with more real-world use cases than its predecessor Bitcoin. A combination of smart contracts and dApps keep developers intrigued and users interested in the network. Large banks routinely spend more than $200 million per year on cybersecurity. If the servers of a central bank were to go down, you would see the collapse of a country’s payment clearing system. However, if every bank within a payment network instead transacted through a blockchain, there would be no single point of failure. Therefore, a country’s interbank payment network could be maintained even if multiple servers were to go down. Also, because the basic idea behind blockchains- creating a distributed, public and immutable ledger with a never-to-be-tampered with the record of transactions remains the same, the data behind the credit score of a user becomes more reliable for financial companies. Related industries like insurance can also be hugely benefitted as they can disburse payments more easily to their customers. Ethereum empowers startups by letting them launch their own Initial Coin Offerings (ICOs). These tokens, usually created using the ERC20 protocol, help startups in raising the funds needed to realize their goals. 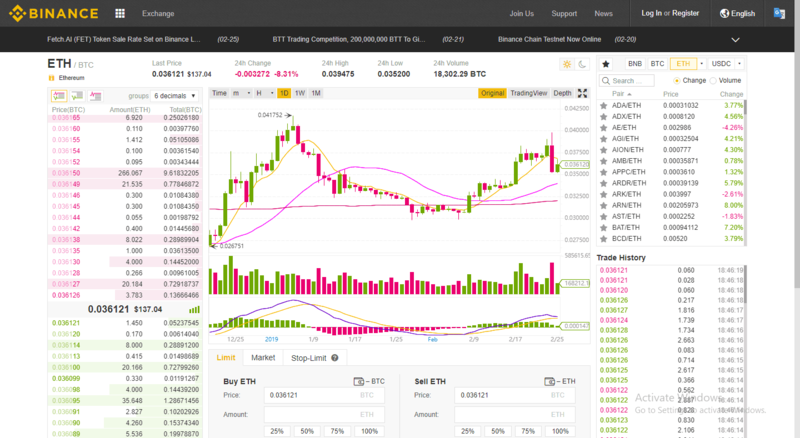 Interestingly, one of the largest crypto exchanges and companies in the world, Binance, used funding generated through the sale of BNB, a coin that follows the ERC20 standards. Even Tron, one of the largest blockchain projects in the world started out with an ERC20 token offering. Since data and identity theft is such a menace, a smart contract solution is a good fit for this problem. Using information hidden behind a dedicated smart contract, users could not only take their identities digital but rest assured that they do not reveal more than what they are comfortable sharing. Services like uPort allow users to take back control of their identities and share only the information they choose through their mobile devices. Information can only be shared upon authentication from the user and the data is always stored safely on the Ethereum blockchain. A major application for Ethereum smart contracts looks set to be in supply chain management where it could benefit both consumers and suppliers through more efficient tracking. Whether you want to know about the freshness of produce or the origins of the diamonds you bought for your wedding, blockchain-based smart contracts can help to deliver this. The supply chain system of the world is currently broken but not beyond repair. Using an extensive network of smart contracts, companies can track their raw materials and the transportation of goods. They can accurately measure their manufacturing processes, related logistics and the process through which a product reaches a consumer. The consumer, on the other hand, is provided with reliable information that instantly proves whether a product is fresh, authentic, fair trade, locally produced and more. Other major industries and applications where Ethereum could find many uses include Real Estate, Law, Oil and Gas, Energy Grid, Government, and Commodity Trade Finance and more as stated by ConsenSys. 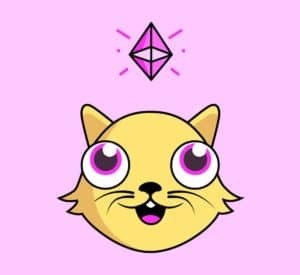 The internet’s obsession with cats knows no bounds and when CryptoKitties was launched, it was evident that there would be more than a handful of interested players. The game allows players to buy, sell, collect, and breed digital cats. Each cat is unique and has its own value. CryptoKitties received widespread attention from the media, the crypto community and the “uninitiated” people who may have never heard about cryptocurrencies and blockchains before when cats on the game started selling for thousands of dollars. The second-generation blockchain cousin of LocalBitcoins, LocalEthereum solves one BIG problem for buyers- removing middlemen from the crypto ecosystem. You buy ETH over the counter using smart contracts and escrow services available on the platform. The seller’s Ethereum is locked via a smart contract and is released only when they receive the agreed fiat currency from the buyer. Some of the most popular dApps on Ethereum are decentralized exchanges- they are new, innovative and remove a big hurdle from the world of digital currencies, providing more power to the users. The first adopters of IDEX were speculators, and the exchange enables a huge range of Ethereum and ERC20 tokens to be traded and exchanges. However, popular cryptocurrencies such as XRP, Litecoin, Bitcoin and Tron is not possible. Giving other freelancing job platforms a run for their money, Ethlance allows users to work on gigs or projects of their choice without paying a hefty fee. This could mark the beginning of the end of freelancers having to give away over 20% of their earnings to centralized platforms such as Upwork in “fees” and part with even more dollars to get the money in their local currency. 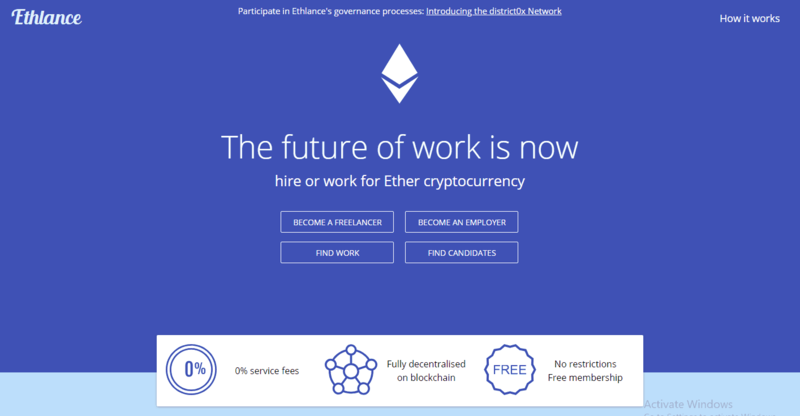 Ethlance, the decentralized freelance hiring platform allows you to work for zero fees. The only payment here is the gas utilized on Ethereum. Other popular Ethereum dApps include FCK, Kyber, ForkDelta, Etheroll and more. Fault tolerance – Systems use redundancy to remove the risk of accidental failure. If one element goes down the network still works, this means applications can run with zero downtime. Attack resistance – There is no single point of failure, as the applications run on the blockchain. This makes them impervious to denial-of-service (DDoS) attacks. Tamper & corruption proof – Applications run precisely as programmed removing the possibility of fraud, censorship or third-party interference. This makes it more difficult for an individual or group to act for its own benefit at the expense of everyone else. No middlemen – This removes exuberant fees and allows users to interact directly with each other (peer-to-peer). This can lead to greater transparency, trust, and privacy. Open source – An open source protocol enables anyone interested in the dApp to collectively contribute to its development for the benefit of everyone. Speed – Currently the dApps can be quite slow with transactions also taking a long time. Scalability – The limit on how many transactions can be processed per second might be quite low which limits the dApps scalability. Fees – While in some ways the ‘compensating system’ is a benefit, it also means users have to pay each time they use the dApp. It’s worth noting that solutions and new innovations are constantly occurring in the nascent dApp and blockchain industries, so the current ‘cons’ may well be overcome in the future. The DAO was a project that crystallized most of what blockchain technology stood for since its inception, in both its business model and management structure. It was created in 2016 by members from within the Ethereum community, notably the Slock.it developer team. The DAO was conceived as a form of investor-oriented, stateless, decentralized venture capital firm after raising a record-breaking crowdfund sale of around $150 million worth of Ether in May 2016. Unfortunately, when things were looking up for the project, it turned out that there was a flaw in its source code, and that flaw was eventually preyed on. On June 17, 2016, some hacker(s) exploited a loophole in the DAO smart contract and drained as much as 3.6 million ETH (around $70 million at the time) to a subsidiary account in just a few hours of the attack. In fact, the attack was found to be made possible when the hacker(s) realized that the smart contract was mistakenly coded to check the internal balance after sending coins not the other way around. The attacker(s) proceeded by requesting funds from the smart contract several times before the smart contract could update its balance. The hack marked the beginning of the end for the DAO and had far-reaching consequences on the Blockchain space that are still tangible today. Besides delisting the DAO token off major exchanges in the months following the hack, and hard forking the Ethereum main chain, the incident caught the eye of regulatory watchdogs all over the world, and put a special emphasis on the necessity of placing the cryptosphere under close scrutiny. In the wake of the DAO hack, the Ethereum community gathered and debated on the proper actions the foundation should take in order to handle the disastrous situation the hacking incident has cast over the project. The community split into two fundamentally opposed groups. While one side suggested a hard fork to contain the hack, reverse it, and send the stolen funds back to their original wallets, the other side strongly opposed the move invoking ideological reasons, and arguing that prevailing with the code and trusting the smart contract under all circumstances, is the philosophy behind Blockchain, and failing to commit to it, could open the door for similar actions in the future. A vote took place in July 2016 and the decision to implement a hard fork to the Ethereum code and move the stolen Ether away to a new smart contract was agreed upon by a vast majority of the community including co-founders Gavin Woods and Vitalik Buterin. Consequently, a hard fork occurred on the main Blockchain at height 1,920,000, right before the hacking incident took place. The offshoot kept the name Ethereum and named its fuel Ether, ETH. However, the other group, or “the code is law” advocates, decided to stick with the original chain, which became known as Ethereum Classic. Did you know that Google CEO Sundar Pichai’s 11-year-old son mines Ethereum? The young one, Pichai says, understands a lot about cryptocurrency and has corrected him on occasion. Do you know as much about Ethereum mining as Pichai’s son? Well if not, don’t worry as we have all the information you need here to boost your knowledge on the subject. In a nutshell, Ethereum mining is similar to Bitcoin mining. 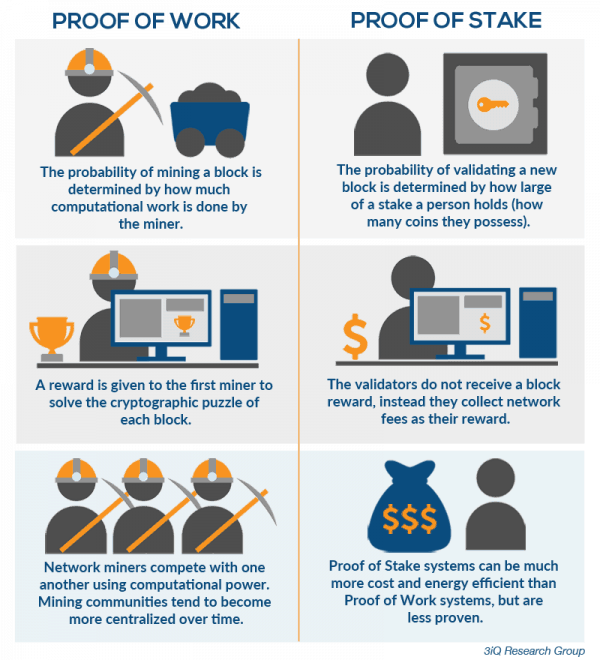 The concept of mining, i.e., giving rewards to “miners” who create new blocks in the network in the form of a native cryptocurrency of the blockchain, is the same. However, the Ethereum blockchain is faster than Bitcoin’s, which means that blocks are created at a faster rate. In the Bitcoin Network, a new block is created every 10 minutes while Ethereum achieves the same in 15 seconds. 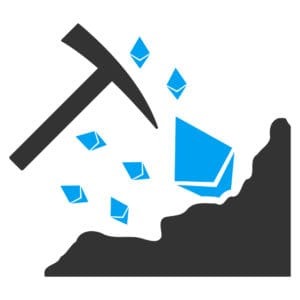 Miners on the Ethereum network receive ETH tokens along with all the gas contained within their block (gas is the fuel of all Ethereum transactions which manifests as code-processing and transaction fees on the blockchain). Can You Mine Ethereum With ASIC? Yes, it is currently possible to mine Ethereum with ASIC. However, an Ethereum Core Development meeting recently pushed forward a proposal called ‘ProgPoW‘ that would make Ethereum ASIC resistant. How Many Ethereum Nodes Are There? According to Ethernodes.org, the Ethereum mainnet hosts about 8,752 nodes at the moment. However, this figure changes on a daily basis. 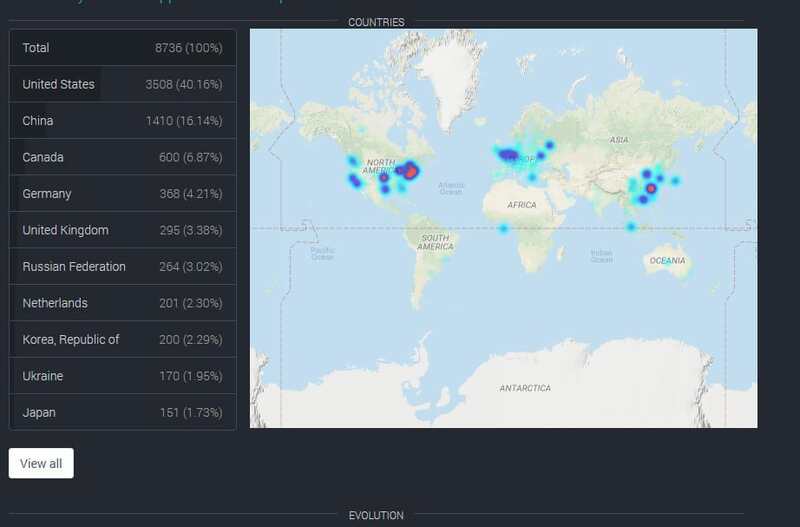 Of these, the largest majority of nodes are based in the USA while China, Canada, Germany, the UK, Russia, and more trail quite far behind. Are These Nodes Full Nodes? A full node is any computer that enforces all the rules of consensus on the Ethereum network and is connected to it. A full node must have the entire Ethereum blockchain downloaded on its computer. By definition, all miners in the Ethereum network have to be full nodes. However, all full nodes do not have to mine the currency. The nodes have a few important functions. They have to ensure that all the miners are given the correct block rewards. They must ensure all transactions have the right signatures. They must check that all blocks and transactions are in the right data format. They must make sure there is no double spending in the blocks. How Can I Use Ether (ETH)? Ether is one of the most versatile coins available in the cryptocurrency space today. As the second largest cryptocurrency in the world, Ether has many holders. Per the most recent CoinMarketCap data, Ether is valued at over $15 billion with 104 million coins in circulation currently. Ether can be used as an alternative to using credit cards and wire transfers. However, to make a transaction with Ether both the sender and receiver must have an Ether wallet set up. For cross-border payments, Ether could work to be much cheaper and faster than traditional methods. When participating in token sales, Ethereum is often a popular cryptocurrency of choice. As a large number of Initial Coin Offerings are offered using the Ethereum blockchain, it means that buying tokens from these projects using ETH becomes easier. Several cryptocurrency startups are pushing for the adoption of digital currencies and helping in the installation of PoS machines and other methods that enable purchases using ETH. Many websites now accept payment in Ether, and your dApps could also accept ETH payments, enabling you to purchase anything from extra lives in games to subscriptions of a magazine. Ether is one of the most commonly available trading pairs for digital currencies used in exchanges around the world. You can purchase Ether and hold it as an investment or exchange it directly for other cryptocurrencies. How Can I Store Ether (ETH)? Once you have bought Ether, you will need an Ethereum wallet to store it securely. You have the option to use hot wallets, cold wallets, hardware wallets, paper wallets, desktop or mobile wallets. There is one for all platforms; some options will be better suited in comparison to others. Note: Hot Wallets are connected to and can be accessed on the internet, whereas, cold wallets are very rarely or never connected to the internet. Due to this many consider cold wallets to be more secure than hot wallets. You will most likely buy ETH on an exchange like Coinbase or Binance. These exchanges will provide you with a wallet where you can store your ETH. Exchange hot wallets are easy to use, very simple and it’s usually easy to liquidate your holdings since your coins can be accessed on the exchange’s website. Therefore, exchange wallets can usually be accessed from multiple devices as long as you have a connection to the internet. The problem with these wallets is that they could be more vulnerable to theft than others depending on the security of the exchange and your account. 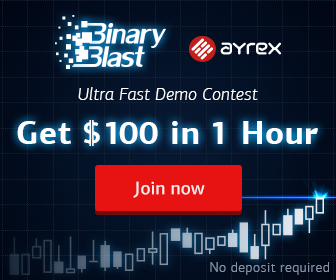 If you trade regularly, then this is likely the best and most convenient option. Hardware wallets can offer their users extremely strong security when used correctly. They are usually USB devices, and the market leading provider of hardware wallets currently is Ledger. You can store your Ether holdings on a hardware wallet for as long as you wish and rest assured that they cannot be reached by a hacker. Just make sure that you do not lose the device or tell anyone else your passwords. Paper wallets are considered the most secure way of storing your Ether safely away from malware and cyber-attackers. With a paper wallet, you print your private keys and Ether addresses and store them in a safe location. However, to many, this can seem like a big inconvenience when compared to using an exchange wallet for example. Again, like with hardware wallets, it’s important to keep your paper wallet somewhere safe and never share the information with anyone else. As the name suggests, desktops and mobile wallets can be distinguished based on the devices where they are being used. Desktop wallets can be more functional, while mobile wallets provide more convenience. Mobile and desktop wallets can usually only be used on the device where they are installed. Therefore, if you lose the device, this will put your funds at risk. Some mobile/desktop wallets will be specifically designed for storing Ether and ERC20 tokens, whereas some will allow you to hold a wide range of cryptocurrencies together. Given that there is such a wide range of wallet options out there, it begs the question, which ones are best? The Ledger Nano S squeezes both advanced security and ease of use into one package. Our guide to storing cryptocurrencies securely on a Ledger Nano S can be found here. This simple, easy to install and easy to use browser-based wallet lets you connect to Ethereum and a host of dApps hosted on the blockchain instantly. MetaMask is a highly popular wallet which has also received funding and support from ConsenSys and Ethereum. Fake versions of this wallet are out there so make sure download a legit version. If you are looking for nothing but the bare basics, then the Mist Wallet is the right choice for you. It was created by the Ethereum Foundation for a no-frills, no-distraction experience and is listed as the most basic wallet available on ethereum.org. If you hold numerous cryptocurrencies and want a well-designed wallet that eliminates the need for multiple crypto wallets, then Exodus could be a good choice. Exodus is is fairly popular amongst crypto users and some cool features, including the portfolio feature where you can track your holdings. MyEtherWallet is one of the most popular Ether wallets out there. As a web wallet, it allows you to log in from any device, which does bring some security risks. However, these risks can be mitigated if it’s paired with a hardware wallet such a the Ledger Nano S.
Trust Wallet is now Binance’s official cryptocurrency wallet, and the app is available to download on both iOS and Android devices. It supports Ether and all Ethereum network tokens such as ERC20 tokens, as well as many other leading cryptocurrencies such as Dash, Tron, Litecoin, Bitcoin, and more. Where Can I Buy or Sell Ethereum? Cryptocurrency exchanges are the most common choice for buying or selling Ethereum. Cryptocurrency exchanges can be centralized or decentralized. Ether is available to buy, sell, and trade on all of these exchanges. As Ether is a leading digital coin, it is available on most cryptocurrency exchanges. Different payment methods for purchasing Ether on exchanges include by credit/debit card, with fiat currencies, and with cryptocurrencies or stablecoins. The fees charged by different exchanges will vary and will also depend on the payment method. Other options include cryptocurrency ATMs where you can buy Ether with cash, trading Ether peer-to-peer on LocalEthereum, and using conversion exchanges like Changelly and Shapeshift to swap fiat-to-ether or crypto-to-ether instantly. Coinbase is a leading and popular cryptocurrency exchange based in the US. Currently, over 18% of the platform’s volume comes from ETH/USD trades. For people using the exchange’s services, Coinbase provides a hot wallet which can be used to store currencies. Coinbase holds over 98% of its user’s funds offline and takes other security measures, which prevents thefts and hacks from damaging user’s holdings. Any funds stored online by Coinbase are covered by insurance. Coinbase also enables two-factor authentication for the users, further protecting them from unauthorized access of accounts. Coinbase also runs a bug bounty program with an active community of security researchers that help to keep the platform safe. None the less, some users still may want to take full control of their security rather than rely on an exchange. If so, using one of the secure methods mentioned above such as a hardware wallet or paper wallet would be a good option. 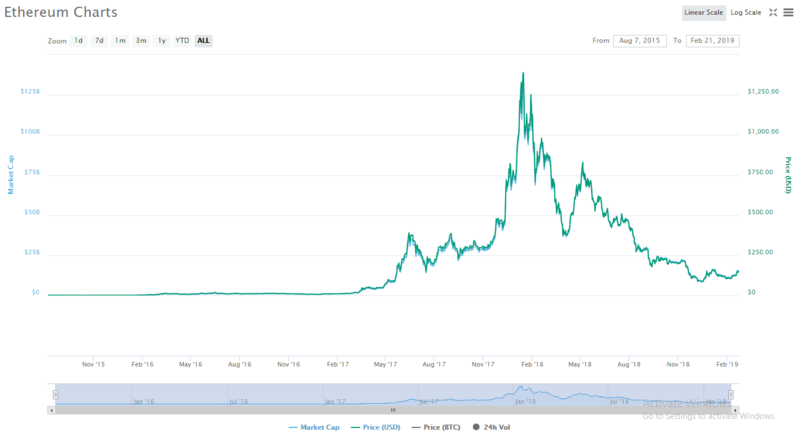 As of February 21, 2019, the price of Ether currently stands at $143 with a market capitalization of $15.2 billion. In November and December 2015, Ether traded below the $1 mark. However, a year later, between October and December 2016, Ether’s price was nearing $10. In June 2017, prices went as high as $377.56 with market capitalization reaching over $34 billion. on January 13, 2018, the price of Ether reached an all-time high near $1,400, with a market capitalization of $133 billion. Since then, Ethereum has witnessed a massive sell-offs and tumbling prices in an unwavering bear market. However, like with all markets, a boom and bust cycle exists, and now everyone is waiting for a new bull market, with hopes that Ether could one day make an all-time high again. Ethereum has caught the attention of many crypto enthusiasts as well as prominent personalities from the traditional finance sector. Some have also made predictions about Ethereum’s price. Let’s look at what they had to say. Co-creator of Ethereum, Steven Nerayoff noted that billions of dollars were being poured into the Ethereum ecosystem in Jan 2018, through ICOs. He was vouching for a $3000 price tag on Ether by the end of 2018, but unfortunately, this did not materialize. deVere Group CEO Nigel Green suggested that Ethereum could reach $2500 by the end of 2018, followed by further increases in 2019 and 2020. Russian-Canadian programmer Vitalik Buterin is the co-founder of Ethereum. BREAKING NEWS: I hereby announce that I, Vitalik Buterin, am the founder of ethereum. Vitalik conceived the idea of Ethereum and released a white paper in 2013 describing in detail its design and rationale. Vitalik had already been interested in Bitcoin and cryptocurrencies since 2011. He co-founded the news website named ‘Bitcoin Magazine’ where he published hundreds of articles and was also involved with the privacy-focused Dark Wallet project. It was during this time that Vitalik came up with the idea of a single blockchain that could be reprogrammed to create custom decentralized applications rather than having to develop a whole new blockchain. In January 2014 Vitalik formally announced Ethereum at the North American Bitcoin Conference in Miami and started working with Dr. Gavin Wood who he went on to co-found Ethereum with. In July 2014 they launched a 42-day public sale of Ethereum tokens known as ‘Ether’ raising more than $18 million, which was the most successful ever crowd sale at the time. The Ethereum platform went live and launched a year later on June 30, 2015, allowing developers to start creating and running decentralized applications. Apart from Vitalik Buterin, other people were also involved in designing and perfecting the concept of Ethereum. The most prominent among them is doctor Dr. Gavin Wood who wrote the “technical bible” called Ethereum yellow paper, which outlines the details of the Ethereum Virtual Machine (EVM). 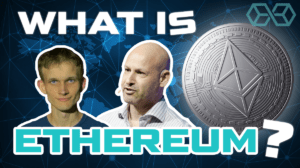 Dr. Joseph Lubin is another prominent name who later built ConsenSys, a Brooklyn-based startup focusing on the Ethereum ecosystem. When the project was publicly announced in 2014, the core team consisted of Vitalik Buterin, Mihai Alisie, Anthony Di Lorio and Charles Hoskinson. How Can Programmers Use Ethereum? Ethereum is a single blockchain with a built-in programming language. It serves as a platform where programmers can create, use and run many different types of decentralized applications. This has led to Ethereum being described as ‘The World Computer’ where just like with conventional computers the potential uses depend in part on the creativity of its users. To get started, programmers can start learning more about the foundational concepts of blockchains- decentralization and cryptography. They must familiarize themselves with the key feature of the Ethereum blockchain, smart contracts, as well as other components like GAS, Ether (ETH), and the Ethereum Virtual Machine. 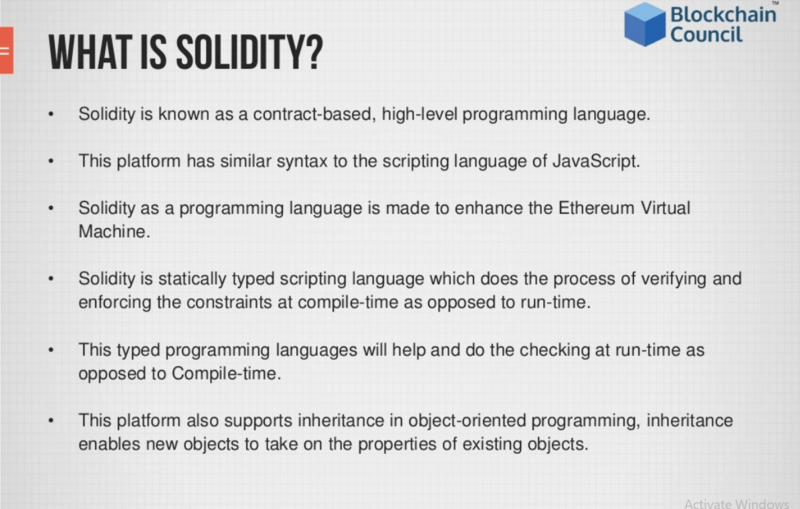 Programmers will also need to learn Solidity, the programming language used for Ethereum. Solidity is the programming language used for creating smart contracts on Ethereum. Solidity was initially proposed by Gavin Wood in August 2014. 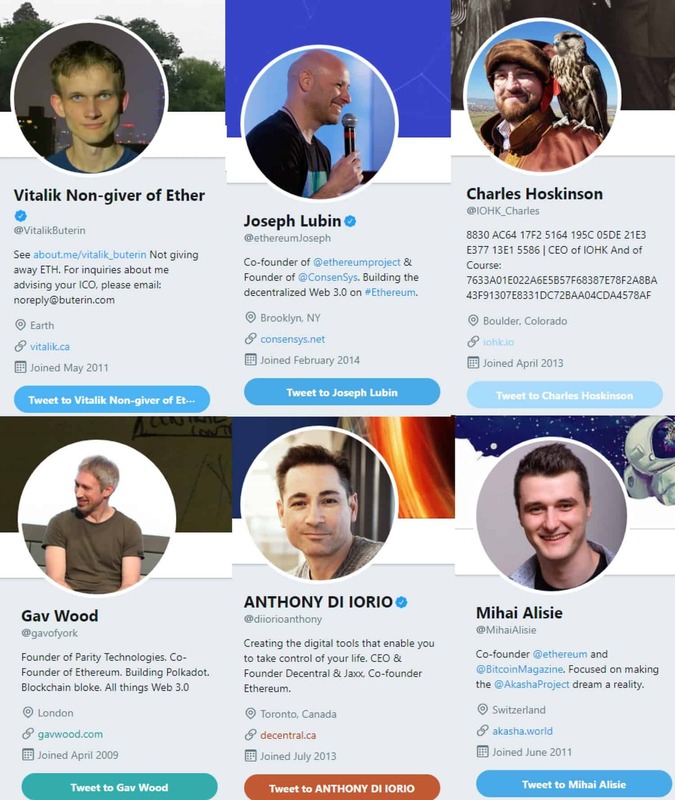 It was then developed by Gavin Wood, Alex Beregszaszi, Christian Reitwiessner, Yoichi Hirai, Liana Husikyan, and other former Ethereum core contributors. It was designed to enable the writing of smart contracts on platforms like Ethereum. While Solidity is a fairly new language, there are numerous experts working on it, and there is ample documentation available to help new programmers who want to learn the basics. Ethereum has struggled with some scalability issues which could be a hurdle to the widespread adoption of the platform and Ether. Ethereum wants to overcome these hurdles with Ethereum 2.0, the Casper Upgrade. The upgrade is expected to arrive in 2019. It will include concepts like sharding which is expected to make the blockchain faster and more efficient. Once successfully upgraded, Ethereum 2.0 will then start on its journey moving towards Ethereum 3.0 which will provide the network with security against the power of quantum computers. Scaling could be considered the Achilles’ heel of the Ethereum network; however, a lot of work is being done in the background to try and overcome this. As Ethereum is not just a single blockchain, it also allows users to create their own blockchain-based projects on the original Ethereum blockchain. Furthermore, over 1400 dApps are running on Ethereum currently which means that the network already has a large number of users and processes millions of transactions. The problem begins when the number of apps, projects, and users increases to a level where the Ethereum blockchain nodes are unable to handle the ever-increasing amount of transactions. In fact, when the CryptoKitties game on the Ethereum network went viral in late 2017, the network became congested and saw a 600% increase in pending transactions. This surge resulted in the network slowing down and expensive transactions fees, therefore, reducing the usability/viability of Ethereum applications. Casper – The upgrade that will set to bring about Ethereum 2.0 and move Ethereum to a Proof-of-Stake protocol. It is expected to occur in 2019. Sharding – Splits up the entire network into separate ‘shards’. Each independent shard and its allocated nodes can process certain transactions, rather than the entire network processing each transaction, therefore, increasing throughput. Proof of Stake (PoS) and Proof of Work (PoW) are two popular types of blockchain consensus mechanisms. A consensus mechanism is used to verify and validate the information that’s being added to the blockchain ledger. This ensures that there is no double spending or other invalid data is being added to the blockchain. It also prevents the networks from being harmed through constant forking. There are pros and cons to each consensus mechanism, but, they all aim to serve the same purpose. A primary difference between consensus mechanisms is how the verification of transactions are delegated and rewarded. Ethereum currently uses a Proof of Work system, but the Casper upgrade will start the transition of Ethereum to a Proof of Stake system. The new system will also have a penalty system built in to punish malicious actors. The roadmap to Ethereum 2.0 consists of two combined upgrades, which are Casper and Sharding, as is designed to bring scalability and security benefits to Ethereum. It may take several years for these both to be implemented fully and form Ethereum 2.0. Despite that Casper and Sharding will be combined to form Ethereum 2.0, both are separate projects that will have different phases and implementation and completion times. The Casper protocol is a proof of stake consensus mechanism that forms a major part of Ethereum 2.0 roadmap. With Casper, validators will have to set aside part of their Ether as a stake. When blocks are discovered by validators which they think should be added to the Ethereum blockchain (validated), they will make a bet on it in Ether. If the block is appended to the chain then the validators are rewarded based on their bet sizes. As mentioned above it will have built-in mechanisms for punishing malicious actors on the protocol which will ensure that they cannot game the system and that the system remains trustless. Validators acting badly will have their stakes removed. Sharding, on the other hand, will divide the network into separate shards. Each shard will be designated to process specific transactions, which it can do so on its own. Currently, the entire network is needed to process each transaction, which is likely an excessive use of the network’s resources. That’s why implementing sharding could significantly increase throughput on Ethereum and enable greater scaling. Ethereum’s contribution to the blockchain/crypto world is enormous. Ethereum has opened up new possibilities with blockchain through the introduction of smart contracts, decentralized applications, and tokenized economies. There is no doubt that Ethereum is still a work in progress. It has some issues, especially those related to scaling and the solutions needed will not just come overnight. The future of Ethereum depends on how widely adopted and powerful the network becomes as well as the creativity and talent of the developers who use the platform. Ethereum indeed appears to be heading in the right direction, gaining the attention of many large corporations and institutions. 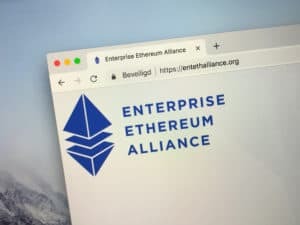 The Enterprise Ethereum Alliance currently has over 386 members that support and back Ethereum related developments. Members include heavy hitters like Intel, JPMorgan, Microsoft, BP, and even the Indian Government. No one can predict for sure what impact Ethereum will have, just like in the 1990’s no one knew how much the internet would impact the world. It’s still early days for Ethereum, but it certainly has the potential to be a revolutionary platform. What is Ethereum? The ULTIMATE Research-Backed ETH Guide was originally found on copy trading cryptocurrency | Blockchain News | Bitcoin News | blokt.com.